This simple card has beautiful wording on it. A baby is a beautiful way to start a person. 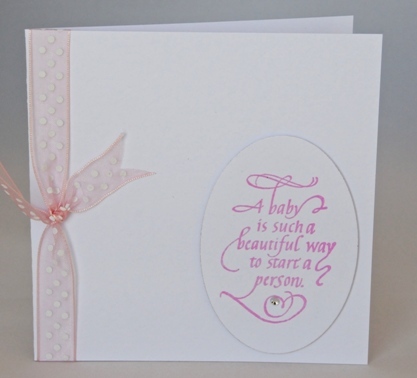 The wording, set in a tall oval, is embossed in pink for a baby girl and has coordinating ribbon. The ribbon is embellished with white spots and the wording with a tiny acrylic gemstone. The design is also available in blue – just let me know at the checkout which colour you would like. The card is blank so that you may write your own words of welcome inside. If ordering by phone, please reference card #647.